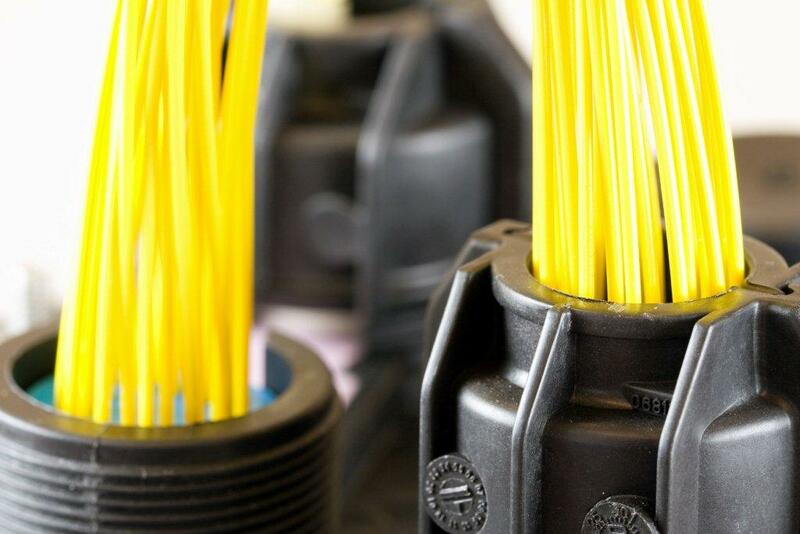 Multimode fibres are intended for all applications where the distances covered are short, such as Local Area Networks (LAN) or all networks with a small reach like campus, buildings or offices. OM3 fibre will support link lengths greater than 1000 meters at both 850nm and 1300nm in LAN applications. A multimode fibre also enables connections for backbone, riser and horizontal links. All these networks are characterised as having many points of access to the fibre and the short distances covered. The index profile of multimode fibres is specifically tuned to provide the optimum solution for these local applications. • Easy splicing – robust and low cost connections for many simultaneous users. • Compatibility including FDDI, Ethernet, Fast Ethernet, Token Ring and ATM. • Low system cost for transceivers; LED’s and VCSEL’s. • Simplified splicing operation facilitated by large fibre core (50µm or 62.5µm). • Core index profile optimised to boost total bandwidth achievable. • Smooth, low cost migration path for premise backbone cabling, from 10Mb/s to 10Gb/s. • Eliminate need to use expensive mode-conditioning patch cords. • Easy cabling and installation – fibres equipped with excellent micro-bending and sensitivity-reducing coating.